Mallorca is the crown jewel of the Balearic Islands. Rich in history and culture, it is popular for its white sandy beaches, mild climate, and beautiful vistas. Explore the mysterious elegance of Mallorca this Mediterranean season with a yacht share, and discover why people have been fascinated with this island in the azure ocean since medieval times. Begin your adventure in the port of Palma. 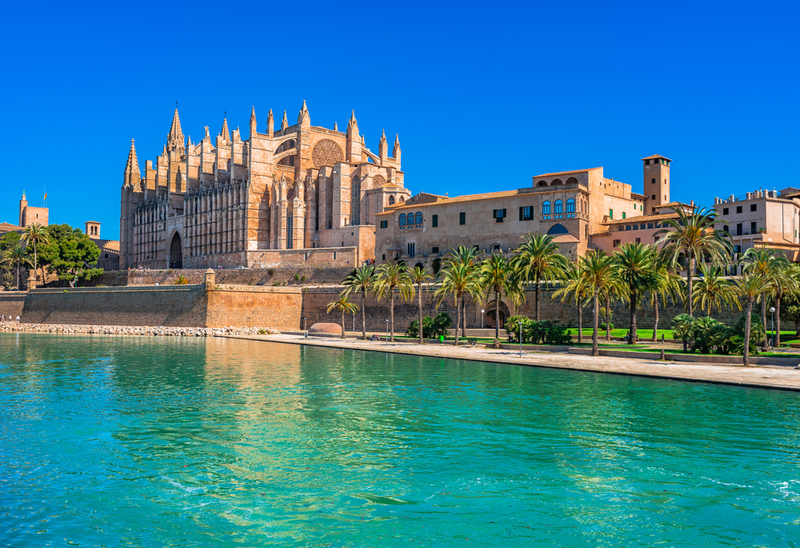 Enjoy a plate of hearty local cuisine, and let yourself be enchanted by the spices typical to the region, or snack on sweet treats like locally made gelato while admiring Palma’s breathtaking gothic cathedral. Designed by the architect Antoni Gaudí, La Seu (as the cathedral is called in Catalan) is one of the highest cathedrals in Europe, and overlooking the Bay of Palma, it offers fantastic views of the ocean. From Palma, take your boat share adventure westwards, and visit St Elm and Isla Dragonera. St Elm, with its palm trees, white sands, and crystal blue waters will almost have you thinking you are in the Caribbean. Isla Dragonera is a small island a little off the coast that a few years ago was set to be transformed into a tourist resort, but after protests from activist groups it was turned into a national park instead, and its natural beauty was preserved. Although uninhabited, Isla Dragonera can easily be reached by boat from St Elm. If the east wind calls you, turn your yacht share around and explore Portocolom, on the eastern coast of Mallorca. It is said to be the birthplace of Christopher Columbus, and history is alive and well in the historical buildings of this quaint town. A fishing village at heart, Portocolom’s natural harbour has preserved its Mediterranean appeal. Flanked by fishing houses, each with their own landing stage, the quay of Portocolom is coastal charm at its finest. Whether you want to hike, swim, and water ski, or sunbathe, lounge and relax, Mallorca caters to all tastes. From the shopping opportunities of Palma to the stunning nature of Isla Dragonera, Mallorca is a diverse and rich destination for any yachting holiday. SmartYacht offers numerous boat shares in Mallorca, including the elegant Princess 50. By flying solo and steering your vessel yourself instead of hiring external crew, you can cut back on your vessel’s running costs, making Mallorca a fantastic and affordable yachting destination. This season, SmartYacht will provide you with free Yachtmaster training, both coastal and off shore, when you buy a yacht share or club membership, so what are you waiting for? Get in touch with SmartYacht today, and find out more about your dream yachting holiday in Mallorca.